Hurricane Harvey ravaged the Texas Coast and left Houston — the nation's fourth-largest city — grappling with unprecedented flooding. Do you need help? Or do you want to help those in need? Check out these resources. It’s been more than a week since Harvey ravaged the Texas Coast and left Houston — the nation's fourth-largest city — grappling with unprecedented flooding. Do you need help? Or do you want to help those in need? Check out the resources below. Check for open shelters and hotels you can stay in — or see open homes through this Facebook page. You can also camp for free in Texas state parks. Residents of 11 counties may be eligible for D-SNAP, a program that offers short-term food assistance for families impacted by Harvey. See if you're eligible for the program here, and find site locations closest to you at hhs.texas.gov/d-snap. The United Way Helpline at 211 has information on shelters and other forms of assistance. Apply for disaster assistance, and check the status of your application, here. You can also file a personal claim with your insurer. Try the Texas Department of Insurance’s consumer hotline at 1-800-252-3439 for insurance help. Check out the Texas Association of Health Plans’ list to see what services your provider is offering. Check out this guide for avoiding fraudulent restoration companies. And check out the Texas Association of Builders’ video on how to hire a qualified contractor to help you rebuild. See the U.S. Small Business Administration’s guide to low-interest, long-term disaster loans. Apply for a loan here. If you have questions, call the SBA’s service center at (800) 659-2955. Need laundry help? Rockport Laundry Chain is a group of volunteers washing clothes and other items for Harvey victims. Lost — or found — a pet during the storm? Check here, here, here, and here. FEMA is providing resources for people with disabilities, access and functional needs on its website. Free Tetanus vaccinations are available at select Gulf Coast and Houston area H-E-B stores. See locations here. Coast Guard Mutual Assistance is providing support to Harvey victims who are members of the Coast Guard, Army and Navy Marine Corps. Are you a business owner? The Texas Association of Business has established a hotline to provide resources to business owners affected by the storm. Call 512-637-7714 or see the website. For legal advice, call the State Bar of Texas legal hotline at 800-504-7030 for toll-free answers to basic legal questions in English, Spanish or Vietnamese. If you need a lawyer, call the State Bar’s Lawyer Referral & Information Service at 800-252-9690. SpareFoot is offering free storage for Harvey victims. DriveSavers is offering free data recovery services to people who have lost files due to water damage. Members of the Texas Association of Orthodontists are helping Harvey survivors find volunteer orthodontists to assist in emergency treatment. Car towed in Harris County? Call 713-308-8580 to locate it. Whole Woman’s Health is providing no-cost abortions to patients affected by Hurricane Harvey. Food banks are asking for nonperishable staples like canned meat and dry goods, as well as cleaning supplies; the Houston Food Bank, Southeast Texas Food Bank in Beaumont, Central Texas Food Bank, Galveston County Food Bank, Food Bank of the Golden Crescent and Corpus Christi Food Bank all accept online donations. Or you can donate to Feeding Texas, a network of food banks across the state. Find your local food bank here. You can open your home to disaster victims through Airbnb, RENTCafé, or by posting on this Facebook group. If you’re in San Antonio, you can sign up to host Harvey victims through the Jewish Federation. Make a cash or diaper donation to the Texas Diaper Bank, which is providing emergency diaper kits to displaced families. The Austin Diaper Bank is also accepting cash or diaper donations to distribute to Harvey victims. Donate underwear, bras and disposable diapers through Amazon or here. The Austin Disaster Relief Fund is calling for 6,000 welcome kits. Several local and national organizations are collecting donations for general disaster relief efforts, including the United Way, Americares, Salvation Army, Save the Children, Catholic Charities USA, United Methodist Committee on Relief, SBP,Global Giving, Direct Relief, Heart to Heart, Arms of Hope and Southern Baptist Disaster Relief. 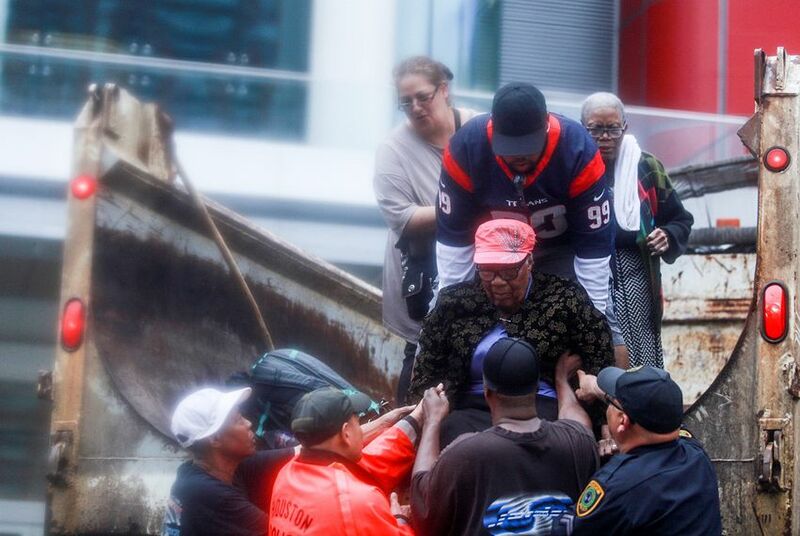 Houston Texans defensive end J.J. Watt has set up a flood relief fund, backing the effort with his own $100,000 donation. Donate here to sponsor families in the Golden Triangle area of Texas (Chambers, Hardin, Jefferson, Newton, Orange and Tyler counties). You can support Houston’s undocumented communities affected by the floods by making a donation here. Help teachers in affected school districts rebuild their classrooms. Teachers of Tomorrow, a Texas education organization, started a relief fund for educators affected by Harvey. You can also donate to Communities In Schools to help schools in impacted areas. Help LGBTQ flood victims through the Montrose Center. Donate to the Texas Workers Relief Fund to aid working families in crisis. The Society for the Prevention of Cruelty to Animals of Texas is helping displaced animals. You can donate at www.spca.org/give or sign up to adopt a displaced animal at www.spca.org/foster. Austin Pets Alive, which transferred more than 200 pets to its shelter as of Saturday morning, is also seeking help, as are the Animal Defense League of Texas and the Houston Humane Society. Carter BloodCare is sending donations to Southeast Texas; see where you can donate here. You can also give blood through the South Texas Blood & Tissue Center — find out more on their website or by calling 210-731-5590 — and through We Are Blood. Volunteers can sign up for trips to the affected area through organizations like Samaritan’s Purse, SBP, GivePulse, Coastal Bend Disaster Recovery Group, Team Rubicon and Voluntary Organizations Active in Disaster. Sign up here to volunteer with the Austin Disaster Relief Network. Apply to help victims by working for FEMA. If you’re a chef, sign up to cook for victims in Houston. If you are a health or mental health professional, sign up with the Red Cross to deploy to affected areas. Are you an attorney? Work for the State Bar of Texas’ legal hotline to help low-income Texans replace lost documents and answer insurance questions. The disaster relief volunteer form is here. Are we missing anything? Let us know at eplatoff@texastribune.org and asamuels@texastribune.org.